Gloria D. Gonsalves, also fondly known as Auntie Glo, is an award-winning author and multi-published poet. Not just a writer, Gloria is a creative promoter for writing itself: she founded WoChiPoDa.com, an initiative aimed at instilling the love of poetry in young people. Her literary works aim to support humanitarian projects, inspire creativity, and impart moral and spiritual lessons. When taking a break from writing, she learns how to take lines for a walk. 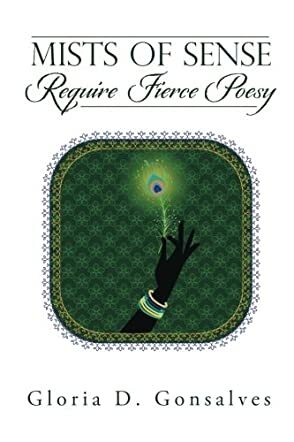 Mists of Sense Require Fierce Poesy by Gloria D. Gonsalves is a book of poetry that illustrates the beauty of social justice, and acts as a comforting prayer that some day we’ll be able to accept the world around us. The collection seems a little disorganized at first. The initial poems begin talking about herself and her experiences, and celebrate her uniqueness as an individual. However, as the collection continues on, the poems begin to explore more of the world around the poet. From her struggles with belonging to any one ethnic group, to the social and political issues around the world, to even how humanity has affected nature, Gonsalves embraces the world through her words and phrases. She teaches the reader just how to fall in love with the earth and everything in it. These poems often highlight the problems humanity faces; loving each other, accepting one another, and even caring for everyone, no matter how painful it can be. One of the poems that impacted me the most was “I Am Rising Until You Love Me”, a poem dedicated to standing up for women, girls, and anyone else who has been sexually harassed. It’s a poem that supports others and makes us think about them in a way that serves to remind us of others. This collection serves as a reminder, telling us to love both each other and the world around us. Whether it be through falling in love with yourself, as well as your own experiences, to the environment and humanity in general, Gonsalves illustrates the comfort we can give to one another. Although a bit repetitive at times, I enjoyed this collection. As such, I would recommend it to those who enjoyed The Heart’s Lullaby by Natalie Ducey and Meaningless Destruction by Shannan Mitchener.